Remember that article in the Wall Street Journal I mentioned earlier, the one that quotes Chuck Fort from BOAT/US? He said, ". . . ethanol is a powerful solvent." After thinking about this for awhile, and after reading an NMMA (National Marine Manufacturers Association) report, I came to the realization that his statement is a little misleading. In fact, ethanol isn't any more of a solvent than grape juice, or, for that matter, gasoline. 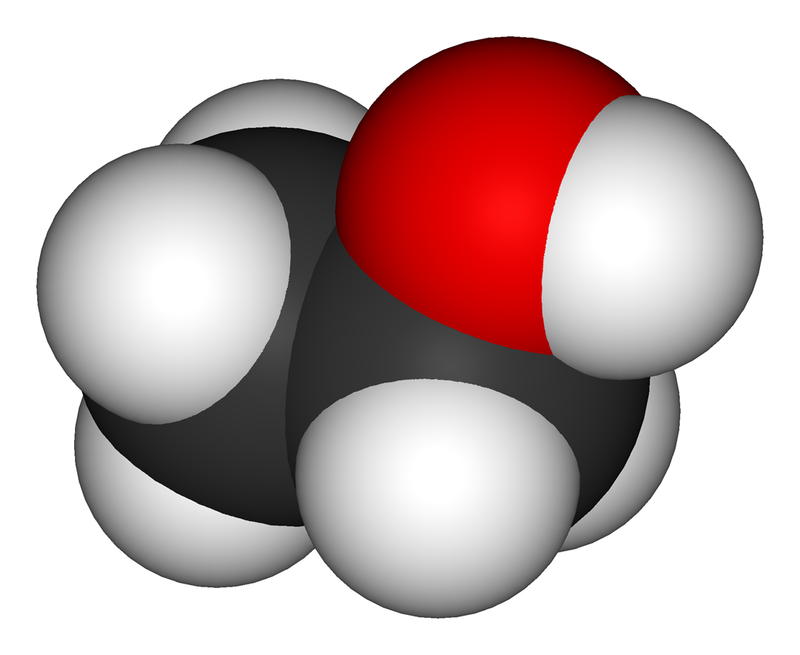 The problem isn’t that ethanol is a solvent, it's that it is incompatible with butyl rubber (e.g. O-rings and hoses) and a certain chemical known as di-iso octyl phtalate, a plastisizer used in fiberglass resin. It also scrubs the protective oxide layer off of aluminum and is electrically conductive. In phase with gasoline (meaning all together as one system), and in blends of 10% or less, most experts will say fegetaboutit. But as I said before, ethanol has this ugly habit whereby it sticks to water more than gasoline. In other words, ethanol will hook up with the condensation in your fuel tank over the gasoline there every time. When it does this, it sinks and concentrates at the bottom of the tank. So what? So you might have ethanol and water at the bottom of the tank? Big deal. Well, in a fiberglass tank, the ethanol invades the pores of the tank, releasing some of the phtalates. These enter the combustion process and end up forming heavy black deposits on intake valves. That's the theory, anyway, based on analysis of Connecticut valve crud, which shows up as di-iso octyl phtalate. Aluminum is another story. An oxide layer protects aluminum. No oxide layer. No corrosion protection. Ethanol and water are electrically conductive, so you have a galvanic issue inside the tank to worry about. Interesting Boats: Have Boat, Will Travel. . . .
Every so often a boat comes up for sale I feel I need to own. Fortunately, it's either priced out of my range, or common sense gets the better of me. The industry trade paper Boats and Harbors is chock full of broken dreams for sale. Here's a follow-up on the initial post, which you can find below this one. Based on reports from boaters in Connecticut and New York, where ethanol-blended gasoline has been in use for over a year, the situation can indeed be problematic. For people with newer boats and engines, the problem is mostly confined to contamination and phase issues. In other words, when water is introduced into the blend, the ethanol gets out of phase with the gas and into phase with the water. (In phase means the two chemical constituents are combined into one system; out of phase means the two parts have separated into individual components.) Once the ethanol and gas have gone out of phase, the water and ethanol combine and settle to the bottom of the tank, leaving a reduced octane gasoline floating on top. In addition, because the ethanol is a solvent, it scours debris from the interior walls of the fuel tank, which causes contamination. Meanwhile, as I mentioned before, these problems can be solved by keeping water out of your fuel tank, watching your filters and changing them more frequently, and making sure you use whatever gas you buy so it doesn't end up being stored in the tank for weeks at a time. Unless of course, the place where you buy gas is selling contaminated and out of phase product. All your precautions won't amount to much if the gas you pump into your tank is contaminated with debris and already out of phase. You'll think you're getting 89 octane but what you're really getting is something with a lot less punch and a lot more dirt. My recommendation is to find a place where the test of time has proven you can trust the gas. Stick with one place and don't shop around. You start to have engine problems, clogged filters, etc., flush the filter and fuel lines, replace elements, and find someplace else to get gas. Another thing, the amount of water in the tank that they say is needed to cause problems is 1/2 of 1%. In a ten gallon tank (1280 fluid ounces) we're talking about 6.4 fluid ounces of water. A little less than a cup. Is Ethanol-Blended Gasoline Bad for Boats? An article in a recent Wall Street Journal points to serious problems for boaters as a result of ethanol being used to replace MTBE as an additive in gasoline. 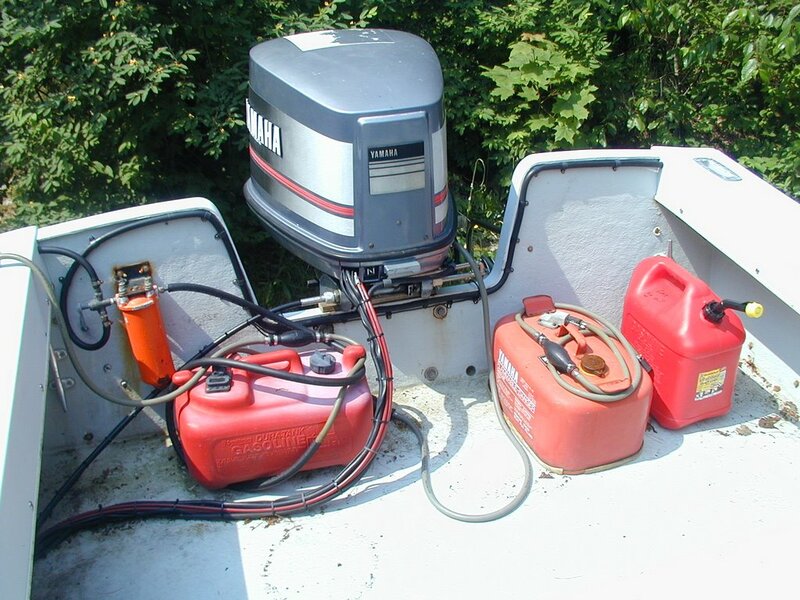 According to the article, condensed water in the boat's fuel tank causes the ethanol to separate from the gasoline. This creates a situation where the bottom of the tank has an ethanol and water mix and the upper part of the tank has a seriously reduced octane fuel. Engines don't like to run on reduced octane fuel, and they really don't like being force fed ethanol and water. Two stroke outboards, twenty years old and older, are particularly sensitive to this and can be permanently damaged. The article further contends that all older hoses and components made with natural rubber (including O-rings) will be damaged and that ethanol is very caustic to fiberglass and possibly also to aluminum fuel tanks. According to the article, which quotes a spokesman from BOAT/US, Chuck Fort, a purported expert on boat maintenance, ethanol is a powerful solvent. Separated from the gasoline, it will dissolve the residue on the inside of the tank and further contaminate the fuel with particles and debris. It will also, according to Fort, accelerate deterioration in fiberglass and possible aluminum fuel tanks. Fort went on to say that owners of boats with fiberglass tanks will have to replace the tanks. While following up on this story and reviewing various chemical resistivity charts for ethanol (a.k.a. grain alcohol, hydroxyethane, ethyl alcohol) I could find no evidence to support the assertions that ethanol is caustic to these materials and/or likely to cause rapid deterioration in rubber, fiberglass compounds or aluminum. In fact, according to the chemical resistivity chart published by the Cole-Parmer Instrument Company, ethanol is less caustic than grape juice. It's also lighter than water and evaporates rapidly in air. Table 1. Comparison of MTBE and ethanol properties (Rice, 1999). So, what does it all mean? Is ethanol bad or not? Seems in high concentrations it is. But . . . ethanol blended gasoline doesn't have more than approximately 10% ethanol. And yet, if it separates from the gasoline due to an interaction with water, it then becomes a pocket of pure ethanol somewhere in the tank. Boat owners and boat buyers need to be aware of this issue and keep abreast of technical updates. While the Wall Street Journal isn't exactly the horse's mouth when it comes to technical accuracy on boating issues, the story should trigger further scrutiny. What we need is a Coast Guard bulletin we can trust. Clearly, more information and study is warranted before individual boat owners embark on the costly enterprise of replacing their fuel tanks. One thing for certain, if indeed water causes ethanol to separate from gasoline, it makes sense for boat owners to refresh their fuel often by making sure they burn what they fuel up with (not keep it stored for extended periods of time) and change their filters frequently. But this is something you should be doing regardless. You might notice how the forecast for a particular weather event will change or fluctuate in severity over the course of a forecast period. This isn't so unusual when you consider how local weather events are predicted. It's true, the forecasters have a great deal of scientific muscle at their disposal in the form of complex computer models, but the vagaries and uncertainties will never be completely eliminated. 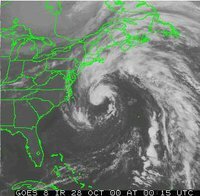 After all, it doesn't take much for a low pressure area moving up the coast to swing a few degrees one way or the other, turning an intended gale into a pussycat or a small craft advisory into a major blow. One way to protect or prepare yourself is to never assume a given forecast is static. All too often, people get caught making assumptions. But don't blame the weatherman. Don't expect small craft advisory conditions with a major depression working up the coast just because the forecast calls for winds of 15 to 25 knots. As the saying goes, "Hope for the best, Plan for the Worst." For example, nothing helps the mariner more than timely information. Keep abreast of changes in the forecast. When you see or hear NOAA report a gale at 23:00, and then see or hear the same report downgraded to a small craft advisory by 07:00, don't be so sure. If the low hasn't yet passed your latitude, anything is possible. In fact, sometimes a forecast will go back and forth for hours, especially when the weather system in question is a tropical or sub-tropical low. So, beware the forecast. Don't blame the weatherman. Stay tuned to NOAA weather radio. And never assume your forecaster has a lock on accuracy. I followed up on an ad for two Dyer 40' passenger boats. These were listed in the classified section of an industry paper called, Boats and Harbors, the bible of commercial boat shopping published in Knoxville, TN. Anyway, the guy I spoke to on the phone told me the boats were originally built to take passengers on trips in the Chesapeake. The vessels were later purchased by a tour company in Lake George. I asked about the layout and the guy suggested I come to New York to see for myself. I asked about the cabin, and he said the hulls were in excellent condition, that if I came up he would meet me and go through both vessels with me. Sounded good, until a little birdy started singing in my head. On October 2, 2005, the tourboat Ethan Allen capsized on Lake George, in Upstate New York, at 2:55 PM. Ethan Allen is raised by investigators after capsizing and sinking 70 ft underwater. 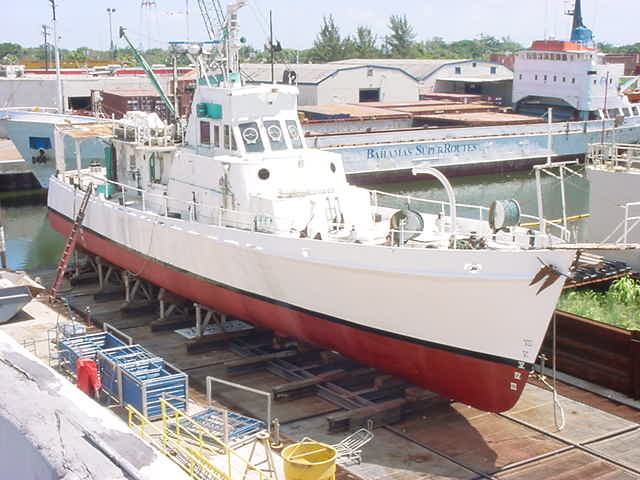 The Ethan Allen was a small glass-enclosed boat operated by Shoreline Cruises. The boat was carrying 47 passengers, mostly seniors, of which 20 died. It is believed that the boat capsized due to waves caused by a larger cruise ship (The Mohican). However, tourists at a nearby camp reported that the Mohican passed by the area where the Ethan Allen sunk 20 minutes later. The boat has been raised by investigators. It was confirmed that weather was not a factor in this accident, as the skies were blue and the wind was calm. The 20 people that died are believed to have died from drowning, not hypothermia, as the water in the lake was 68 degrees Fahrenheit. The injured people were sent to Glens Falls Hospital via Hague, Warrensburg, North Warren, Moreau and Lake George Ambulances.The boat was carrying a tourist group, the Trenton Travelers, based out of Trenton, Michigan. It has been confirmed that all the passengers were from Michigan and Ohio. Not once in the conversation did the guy mention to me the history of the boat. You would think it would be something important to mention given that I had to travel a total of about 700 miles to see it. Can't wait for this guy to call me back. Not that it was a bad movie, or lacked drama and good characterization, but there were enough technical inaccuracies to cause this mariner trouble. Why were the outriggers out and the paravanes down when the seas were in the 80' to 150' foot range (as depicted; more if you consider the last wave)? Why did the crew wait so long to batten down the wheelhouse windows? They knew the storm was coming. They knew how bad it would be. Why didn't they make proper preparations to meet it? Why wasn't the crew in the wheelhouse? I've been in some bad blows, and when it gets really bad, everybody usually hangs out in the wheelhouse with their survival suits within arm's reach. When it's that bad, and the boat has to turn around in monster seas, riding out the turn in the fo'c's'le or galley is the last thing anybody wants to do. Why would anyone think they could remount a SSB antenna in a 50 knot wind when the smallest whip antenna is about 23'? If the antenna doesn't rip your arm off, how are you going to splice the coax? And why not just lay out an emergency long wire antenna on deck? Speaking of which: I thought the Andrea Gail had a long wire antenna and not a whip antenna. I believe that in the photo of the Hannah Boden, which Linda Greenlaw states is a sistership of the Andrea Gail, you can see a long wire antenna running aft from the masthead to the goal post. By the way, Greenlaw states in her book that her boat, the Hannah Boden, was 100'. 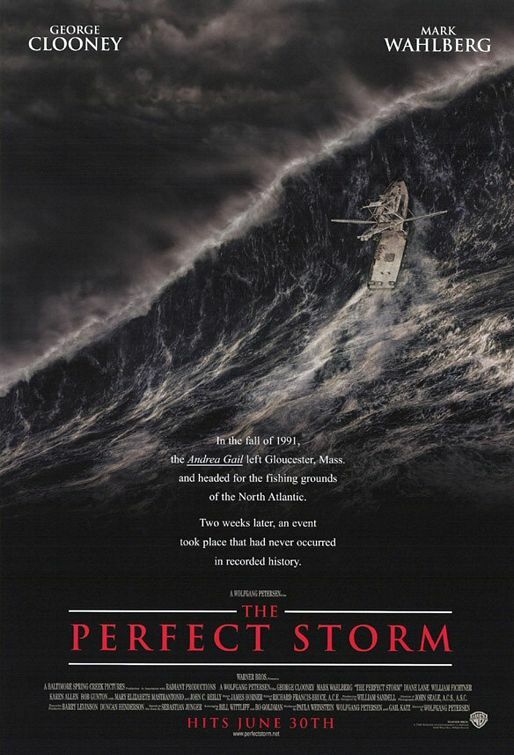 Sebastion Junger, the author of the book, stated on a pre-movie hype news program that the Andrea Gail was 80'. I tend to believe Greenlaw over Junger regarding LOA. And I tend to believe it had a long wire antenna. You'd think it would given its range of operation. Also, if the boat was 100' , the wave at the end would have been about 200'. 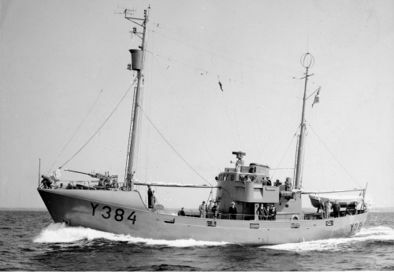 My understanding is that the largest non-seismic wave ever recorded was 112', measured scientifically in the North Pacific by researchers aboard the USS Ramapo on February 7th, 1933. Where can I get one of those blow torches that stays lit after it gets dunked in seawater? Don't get me wrong. I liked the movie. I liked the effects. I thought the film makers did some good things. But I don't think the movie paid homage to the crew of the Andrea Gail or commercial fishermen. I think Junger's melodramatic overspeculations of the sinking (not to mention his speculation about what it's like to drown) are an insult to the thousands of fishermen and other seafarers who've lost their limbs and worse in much less spectacular ways. In truth, the vast majority of commercial fishing accidents and sinkings, aren't caused by gigantic Hollywood waves. They're the result of separate incidents and seemingly insignificant details stacking-up and falling like a house of cards. With all due respect to the people of Gloucester and the friends and family of those who died on the Andrea Gail, and to the film makers and the actors, I humbly submit a different cause and effect scenario with regard to the sinking. In my opinion, had the crew been given the time depicted in both the book and the movie, the ending might have been quite different. Those men were experienced and capable fisherman who had previously handled anything the sea had thrown at them. What probably happened was they started home with a freighted boat. It got rough, very rough, and the vessel started taking on water, probably from some insidious place in the stern, e.g. the rudder box or shaft seal. They didn't know she was taking on water until it was too late, at which time the vessel rolled and sank before they could launch the raft, get into their survival suits, or trigger the EPIRB. How many times has it happened that way? A freighted boat. A slow leak. Bad weather.